I wore this outfit yesterday running errands with Matt. It is a great transitional outfit because the shirt and scarf are both lightweight. I love this shirt so much that I am going to get it in a couple more colors. It is a great top for Fall and it is only $38! Its a great top for layering. Especially with a vest. I love this lavender color and my new Gigi New York clutch came in the mail just in time. Because I think it goes perfectly with this shirt. I don't know why I could not find this exact scarf online. I got mine in the store. Gorgeous, lightweight top and it works so well with the distressed jeans. I absolutely love your mommy-to-be style! Someday, when I am expecting I will your blog for inspiration! Too cute! I love everything leopard, so I may need to add this to my closet! Loving lavender lately! This top is so pretty on you. I LOVE this look! 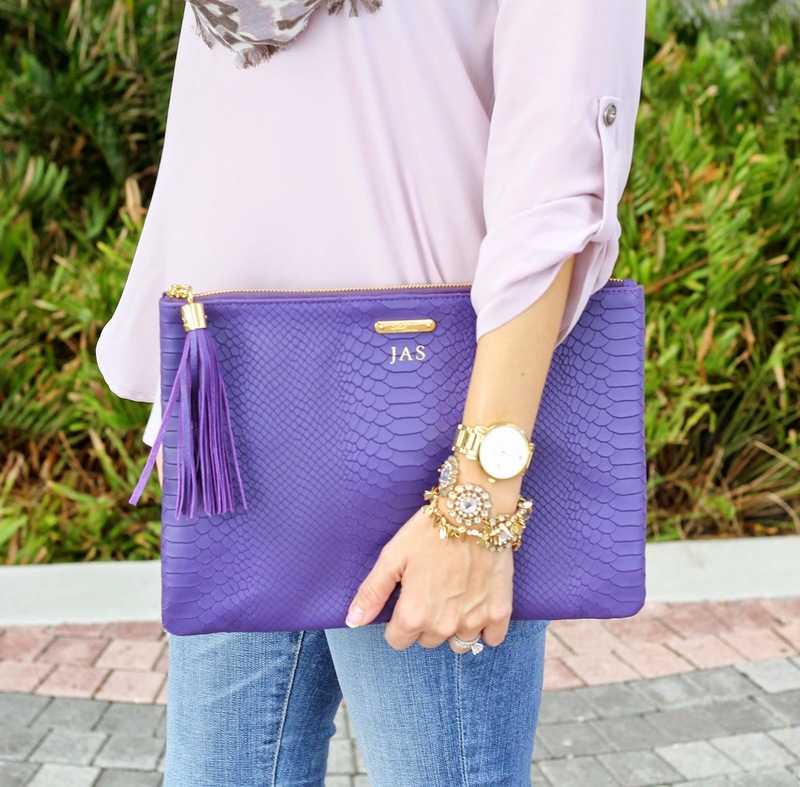 That lavender top is gorgeous and I love it paired with the leopard print scarf and clutch! You have amazing maternity style!! So pretty! I always find lavender and purple pieces so romantic and girly! You look gorgeous! Love this top!!! Definitely going to get one (or two, or three). We must be on the same wave length today :) Love the lavender, looking beautiful. I love this look! I'm still sad Canada doesn't have Nordstrom yet, but every time you post, I consider just ordering it anyways! Lavender is a great color on you, and I'm loving that clutch too! Love the lavender on you! Love the pretty purples in this outfit! The scarf is gorgeous. Beautiful!! I love that color on you…that Gigi clutch is to die for! I adore lavender and it looks so great on you! Love your outfit!